There I went again, buying up another online coupon. What the heck? Am I becoming more like my parents? I am really channeling my inner-Chinese ain't I? What's next, hording the straws and napkins from McD's? OMG, I have some of that in my car!!! Aiya! I'd better stop nagging the kids then, or I'll totally morph! Anyways, this time around, I bought my coupon from Travelzoo, rather than Groupon, Living Social or Social Living. 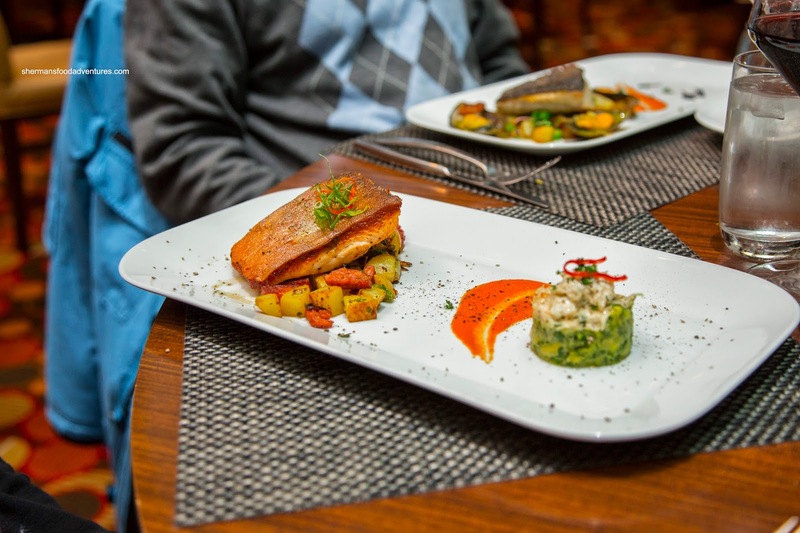 Considering my past experiences, Travelzoo seems to offer better quality restaurants than the rest and my experiences have been consistently better (no, I wasn't paid to say that). So this time was P2B Bistro & Bar in the Renaissance Hotel in Downtown. As part of the deal, we got to order an appie each. 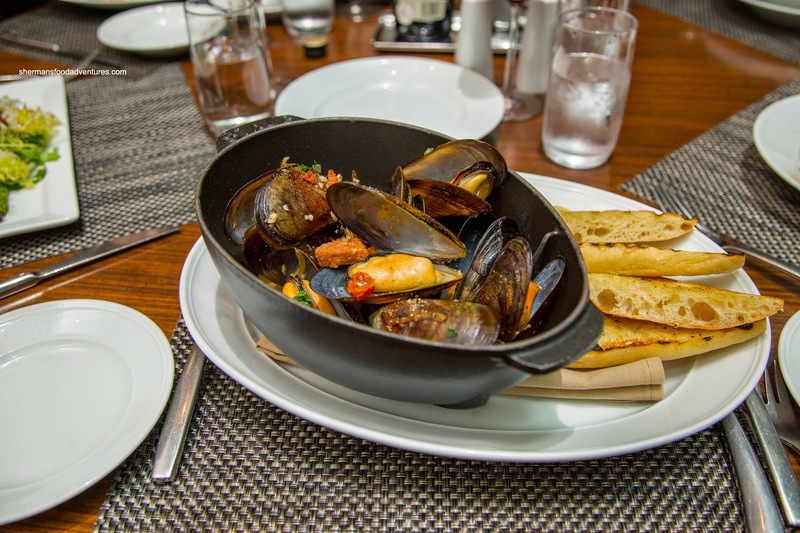 I opted for the Lasqueti Island Honey Mussels with chorizo sausage, honey ale, tomato and artisan baguette. We found the mussels to be plump and naturally sweet. There was definitely a white wine essence which was accented by the ample and spicy chorizo. The only minor issue was the significant salt content. 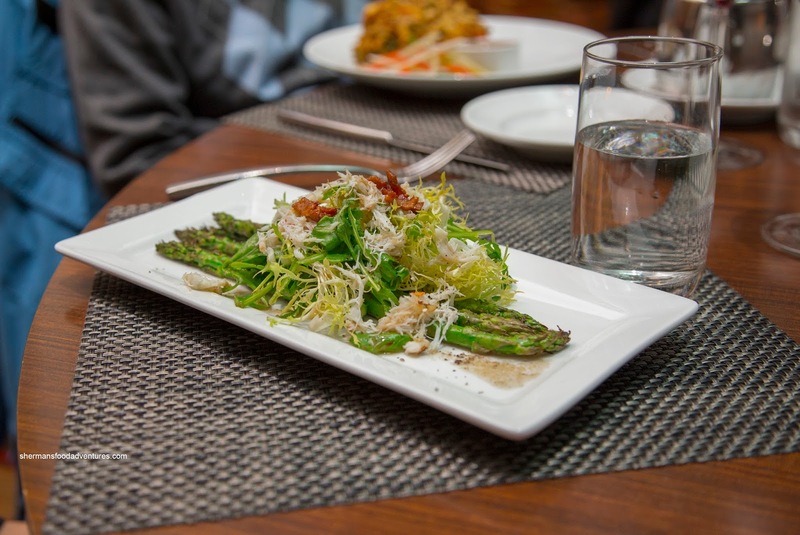 Viv went for the Grilled Asparagus Salad with Dungeness crab, arugula, frisée and warm bacon pepper vinaigrette. Yes, this was a salad, but it fairly entertaining to the palate. With a mildly acidic vinaigrette aided by the slight saltiness of the bacon, it didn't overwhelm the rest of the ingredients. The veggies remained crispy while the crab could've been fluffier. My parents ended up with the Dungeness Crab Cakes with chili lime aioli and the Black Tiger Prawn Fitters with kaffir lime, lemon grass and nuoc mam dipping sauce. 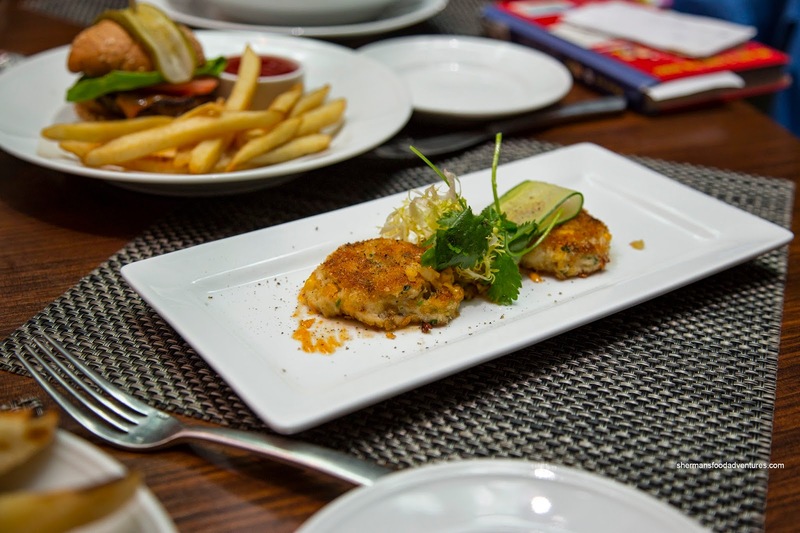 Smallish in size, the crab cakes were soft and actually a bit wet. On the other hand, the exterior was lightly crisp and nicely browned. There was very little filler as most of the filling was crab, hence the flavours were sweet with enough seasoning. The spicy aioli was a nice compliment to the sweetness. 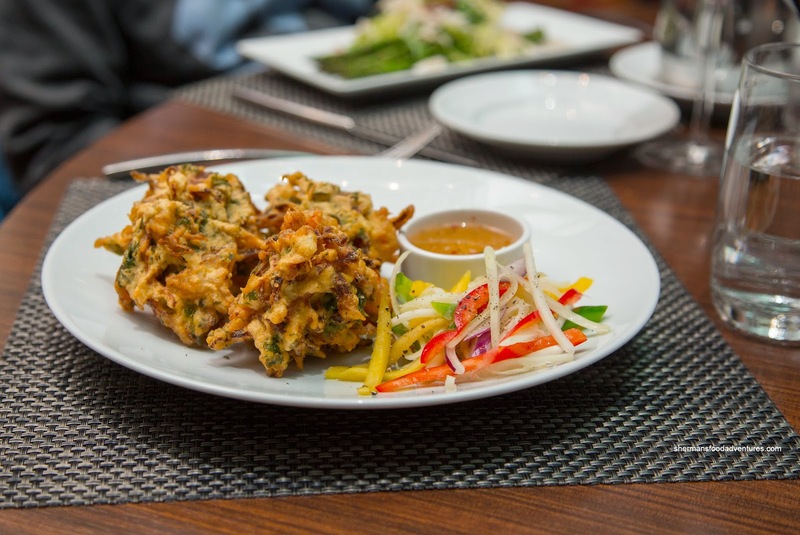 We universally didn't like the fritters as they were truly a fried mess of things. Hence, the prawns got completely lost. When we did find a pieces it was good though with a meaty snap. The fritters were crunchy, but once past the exterior, the whole thing was just too doughy. Even the impactful sweet and spicy dip couldn't do anything to lighten things up. Onto our mains, my dad had the Seared Arctic Char atop a potato & chorizo hash, romesco sauce and with a Dungeness crab and avocado salad. We found the char to be mostly moist (except for the belly portion because it is thinner, which is understandable) with a beautifully crisp skin. The flavours were indeed mild, however, that was the responsibility of the salty hash and romesco. Much like the crab cake, the crab in the salad was a bit wet, but it was pleasant enough with the smooth avocado. 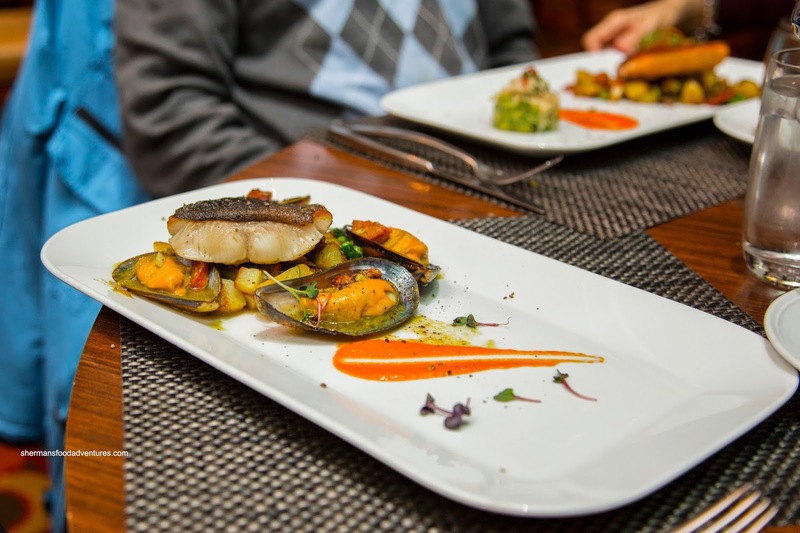 For Viv, she also went for fish with the Pan-Fried Sable Fish with potato & chorizo hash, salsa verde, mussels and romesco sauce. Other than the addition of salsa verde and mussels, the flavours were very similar to the previous dish. As for the fattier fish, it was flaky and buttery with crisp skin. For myself and my mom, we didn't even look at the fish entrees and went straight for the meat. 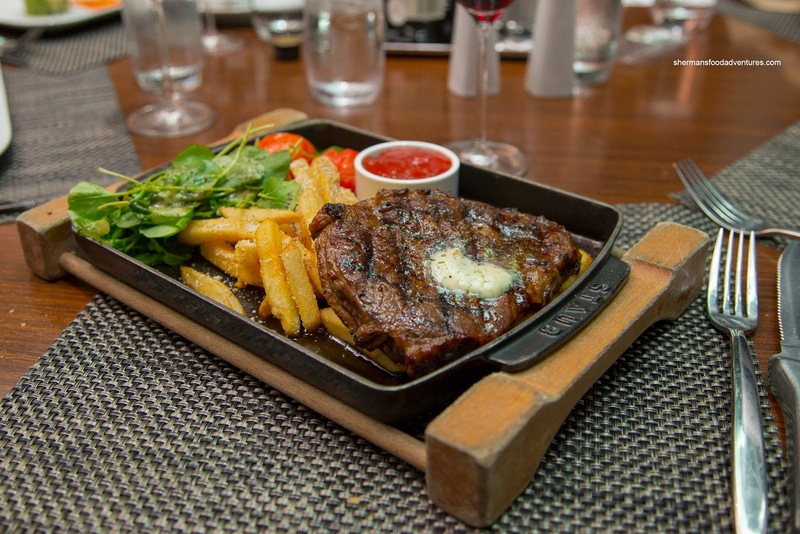 I chose the Rib Eye Steak with blistered tomatoes, fries, herb garlic butter and watercress salad. I asked for medium-rare and it was closer to rare, which I had no issue with. It was sufficiently tender for a rib-eye where the natural meat flavour was amped by the impactful herb butter. The side of Parmesan fries were pretty tasty, but texturally, I would've liked the fresh-cut variety more. Tart and refreshing, the salad and tomatoes helped lighten the dish. 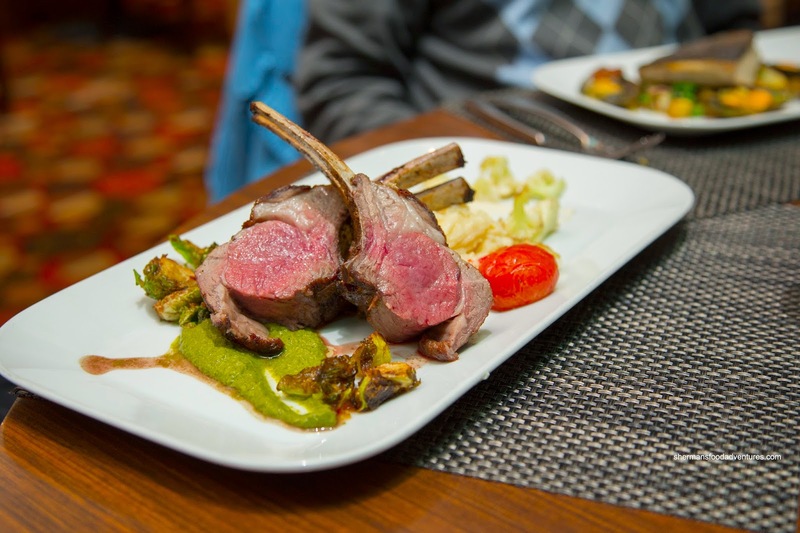 My mom went for the usual in the Roasted Rack of Lamb with whipped goat cheese & yukon potato, cauliflower puree, chimichurri and crispy Brussels sprouts. The lamb was as moist and succulent as it appeared where most of the flavour was thanks to the sticky demi-glace and herbaceous chimichurri. My mom really liked the cauliflower puree as it was smooth and lightly seasoned. For the kiddies, my son had the Cheeseburger and fries. Despite his love for burgers, he was not happy with this one. From the dense and hard bread to the completely obliterated half beef patty, this was a fail, even for a kid's meal. 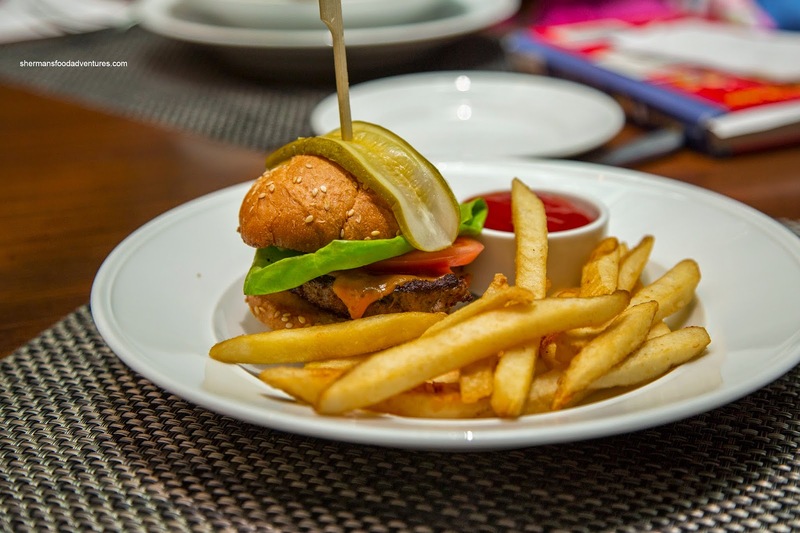 Other than the vibrant lettuce and tomato, the burger itself was hard to bite into and chew. The side of generic fries didn't help either. They were quite crispy though. 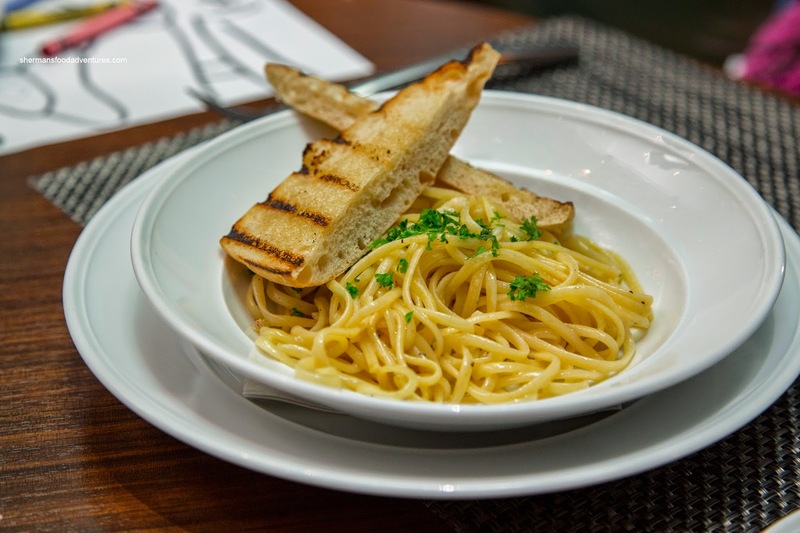 On the other hand, my daughter's Buttery Linguine with grilled ciabatta was good. These noodles were still al dente and tossed enough so that they were not clumpy. Of course the ample butter didn't hurt while the amount of salt was just right. She gobbled this up quickly in all its entirety. Normally, she struggles to finish a whole dish, but she didn't have a problem here (in addition to poaching some of Viv's fish and dessert). 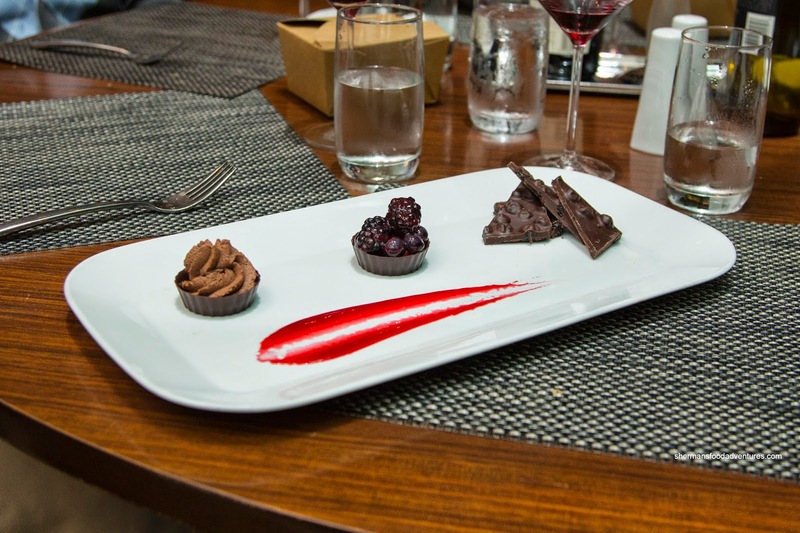 On the topic of dessert, we shared a couple including the Chocolate X Three consisting of fresh cherry chocolate mouse, chocolate berry cup and blueberry chocolate bark. As simple as this dessert appeared, it was decent with airy semi-sweet mousse and slightly bitter and sweet bark that had a firm snap and melted in a fairly silky manner. 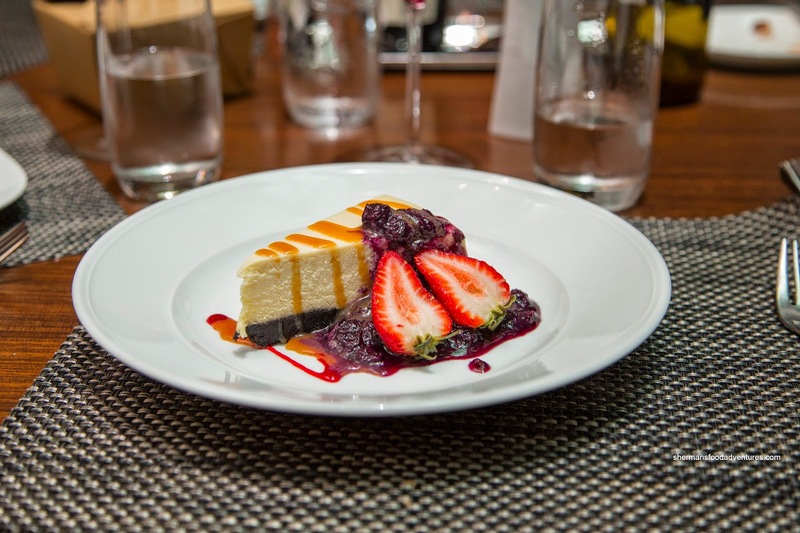 The second dessert was the House-Baked White Chocolate Cheesecake with blueberry compote and bourbon caramel sauce. We found the cheesecake to be smooth and rich with a firm Oreo crust. it wasn't too sweet while the bourbon was not overwhelming. Interestingly, we originally went into the dinner with low expectations since it was a relatively low-key hotel restaurant. Other than a few duds, the meal as a whole was decent complete with exceptional service.